The first night of EuroLeague women's basketball in Valencia went well for the hosts Ros Casares with a comfortable victory against Bourges Basket (74-47). Rebekkah Brunson (left) did most of the damage for the hosts, scoring 19 points and picking up 14 rebounds. 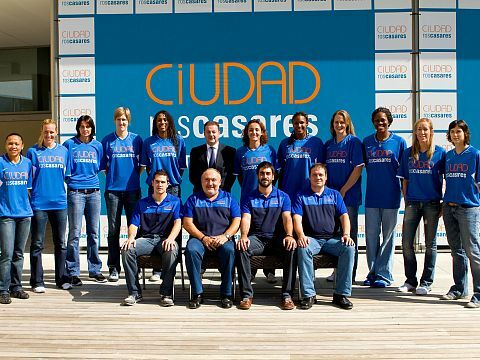 Marta Fernandez and Katie Douglas also finished in double digits with 15 and 10 points each. Emméline Ndongue was the only player from Bourges Basket to reach double digits with 10 points. Linda Fröhlich opened the scoring with a three-pointer with just over a minute played to get the hosts on their way. During the (11-0) opening Edwige Lawson-Wade hit two more three-pointers. Cathy Joens and Styliani Kaltsidou hit back to back treys for Bourges. But the joy was not to last. Brunson continued her one lady demolition act as Ros Casares won the first quarter (20-9). The Ros Casares gala went on all through the second quarter and with 30 seconds left in the quarter they led (41-18). Bourges scored the last 5 points of the quarter (23-41) which gave Pierre Vincent some hope for the second half. Bourges stepped up defensively after the break. So Ros Casares were made to work harder to score. Bourges were not able to get anything going offensively. By the end of the third quarter they had more or less conceded defeat (34-57). Jordi Fernandez, the coach from Ros Casares, continued to turn his bench as his side paced itself to victory.